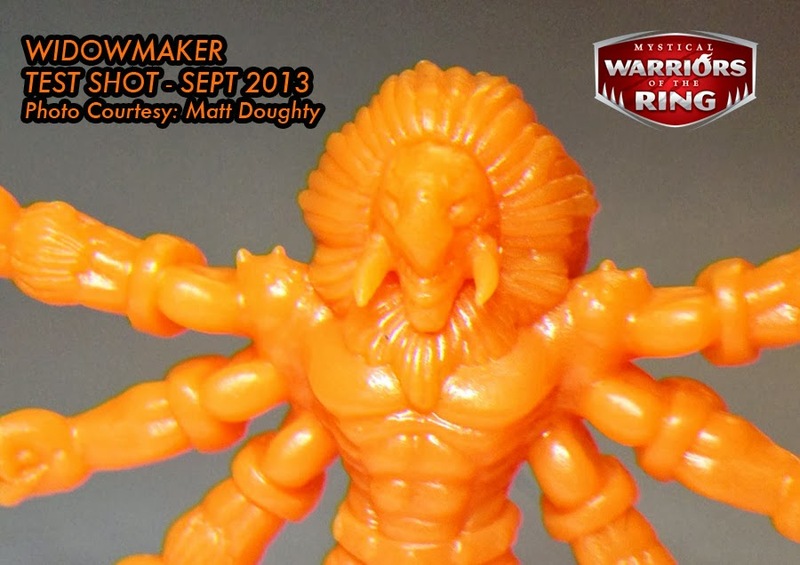 Little Weirdos: Mini figures and other monster toys: Mystical Warriors of the Ring: PVC figures on the way! 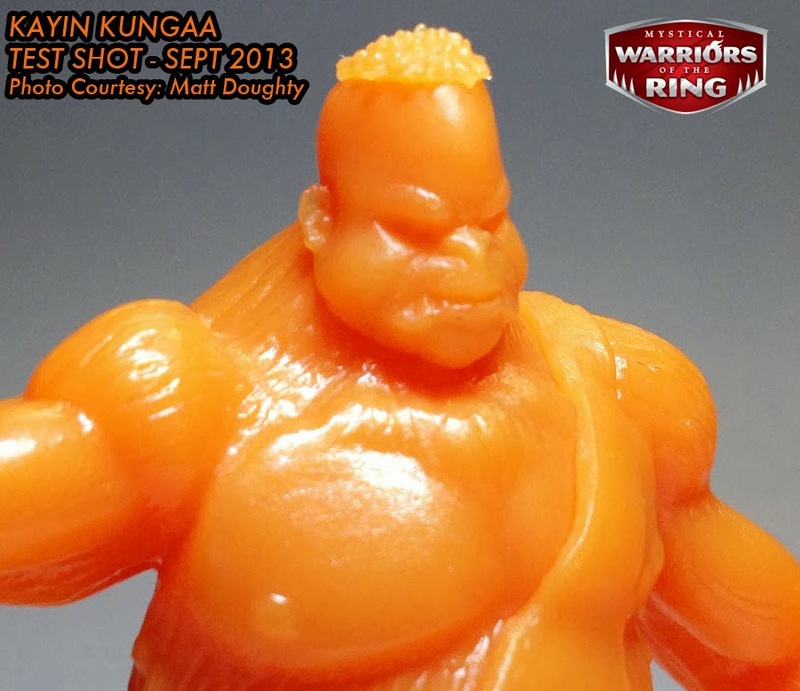 Mystical Warriors of the Ring: PVC figures on the way! 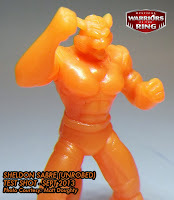 Since its debut this April at C2E2 I've enjoyed keeping up Mystical Warriors of the Ring, a very cool indie mini figure line based on original anthropomorphic wrestler characters and the stories surrounding them. While the toys are reminiscent of classic mini figures like M.U.S.C.L.E. 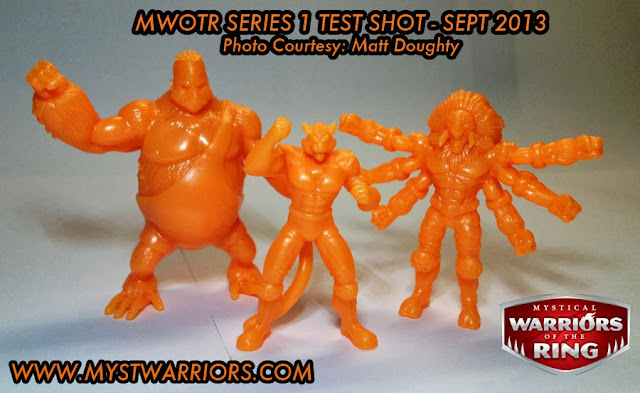 as well as modern ones like O.M.F.G., there's been one main difference from those types of lines: MWOTR figures have been produced in a harder resin material instead of a more flexible plastic. Until now, that is. Fantastic Plastic Toys revealed this week that figures from the line would soon make their debut in PVC! The initial PVC figures will consist of three characters that haven't yet been produced, even in resin. The roundup includes gorilla guy Kayin Kungaa, the spidery six-armed Widowmaker and an "unrobed" version of tiger-man Sheldon Sabre. While the photos here show the figures in a test shot orange color, the actual PVC release will offer the figures in both flesh and bright red varieties. The plan is for the PVC figures to debut for sale at the Onell booth at NYCC next month, and you should also be able to pick them up at the Fantastic Plastic Toys online store on a first-come, first-served basis. If the higher price point of the resin figures was preventing you from diving into MWOTR before, you should be happy to learn that you'll be able to snag the set of three PVC figures for somewhere around $10. You can read more about the PVC release and what it means for the line overall in this blog post on the MWOTR site. Personally, I think this is awesome news and hope we see many other MWOTR characters in PVC down the line. Future runs will be determined by how well this one is received, so if you dig these guys be sure to grab some when you can! So I did indeed read that correctly today. Based on the previous prices of the figures, I thought surely my eyes or brain were deceiving me. That is an awesome price for 3 figures. I know, right? It's great that they can offer them for such a low price. I bet it will. Looking forward to these and any future ones to come!